Saunders’ earliest acknowledged composition is Behind the Velvet Curtain, a work for trumpet, piano, harp and cello completed in 1992, available on a recording by – yet again – Ensemble Musikfabrik, as part of the Musik In Deutschland 1950–2000 series. There’s something sketch-like about the piece, almost a kind of testing of certain ideas – ideas that would turn out to have great significance in her work – in order to experiment with their behaviour and operation. The most obviously nascent idea exhibited by the piece is an emphasis on certain pitches, acting as roaming focal points which the four players continually follow and assemble around. There’s a playfulness about this, with each shift in the focus being initiated – ‘suggested’ might be a better word in most cases – by one of the players, becoming the basis for a short episode of varying clarity. The players somewhat resemble a group of pilgrims wandering from place to place, though whether what’s being achieved by them counts as ‘progress’ is debatable, as it could be argued that they’re simply moving around within a relatively small space (not inappropriate, considering Saunders’ fondness for Samuel Beckett). The overlaps between the pitch centres (which progress as follows: A–B♭-A-D-B♮-B♭-D-B♮-B♭-F♯-C-F♯-C-G-B♮) isn’t sufficient to make them all feel connected to each another – Robert Adlington’s claim, in his 1999 Musical Times introduction to Saunders’ music, that they “form a prolonged melody” is stretching a point – though Saunders at times uses this process of shifting as the basis for drama, such as the argy-bargy that ensues around halfway through as the cello pulls the focus away from F♯ in favour of C, causing a period of conflict that finds a compromise, a minute later, with the cello proffering G instead. The general instability that follows this, breaking up the established behaviour of the group, suggests that this point in the piece (probably coincidentally occurring around the golden section) was critical at a more fundamental level; maybe the apparent agreement between the players wasn’t the whole story; maybe some of them were just, literally, playing along. 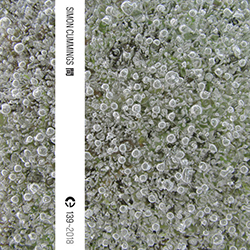 A climactic lengthy outburst of accented chords from the piano suggests an irretrievable breakdown in relations, yet Saunders navigates a resolution through ushering in the final pitch B, which is sustained at length by the ensemble, a rare instance of purity and stability in a world of constant flux. The final two discs i’m looking at, both released on the Kairos label, essentially function as portraits of Saunders from ‘early’ and ‘mid-period’ perspectives. 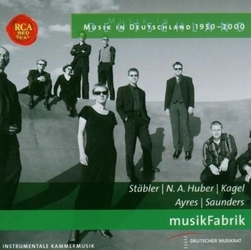 The earlier disc, dating from 2003, focuses on chamber works, performed by Ensemble Musikfabrik conducted by Stefan Asbury. These four pieces – Quartet (1998) for clarinet, accordion, piano and double bass, Into the Blue (1996) for clarinet, bassoon, percussion, piano, cello and double bass, Molly’s Song 3 – shades of crimson (1996) for alto flute, viola and steel-stringed guitar with 4 radios and music box, and dichroic seventeen (1998) for ensemble – share a lot in common, most obviously their level of violence. Three of the four begin with sharp accents, and are thereafter dominated by considerable volatility, though, interestingly, without being single-minded. Quartet‘s opening salvo is the most extreme, the equivalent of a suckerpunch to the face, and its first half seems to be all about such impacts, heavy bruising blows containing subdued traces of pitch in their aftermaths. However, around a third of the way through, Saunders takes the quartet into more ruminative territory, soft and restrained yet all the more ominous for it: the players sound tense, the accordion seems to jitter involuntarily, the double bass growls, everything stops and starts, nothing sounds remotely certain. The tension established here is lovely, and that Saunders maintains it for so long is impressive – until, that is, harmonic clashes bring about a bullish response from the piano leading to a blank, gestural, repetitive conclusion. There’s a more overt melodic impulse in Into the Blue; indeed, the clarinet in its opening minutes sounds as though it’s itching to let loose a flamboyant, Rhapsody in Blue-esque glissando, though the curt demeanour of the rest of the ensemble – reinforced by stern blasts from a whistle – keep it in check. Before long, though, seemingly everyone has shifted to similarly sliding melodic ideas, but Saunders again uses the piano to stir things up, firing like a machine gun and reverting the players’ actions to the business of making loud impacts rather than articulating something more subtle. In many of Saunders’ works, there’s an abrupt shift between the two halves of a composition, and here this comes after a collapse of sorts around halfway through, whereafter the music becomes distant and vague, made up of grumbling blurts and dull thuds, made yet more strange through unexpected moments of glitter. The players occupy a similarly tense space to that in Quartet: no-one seems clear about what to do or why to do it; the answer, if that’s what it is, comes in the form of a seemingly accidental coalescing around the pitch G, driven on by a mixture of tiredness and resignation. 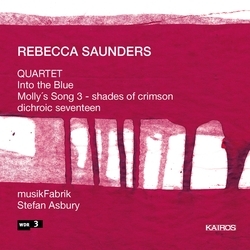 Molly’s Song 3 – shades of crimson explores melody more demonstrably, with the players initially acting as individuals whose only connection is proximity. Before two minutes are up, the music goes through the equivalent of a reboot process, and not just of the piece but of the act of music-making itself, practically undergoing a series of sustained pitch ‘tests’, both isolated and overlaid (resulting in gentle clashes), leading to a lengthy episode that ranks among the most tentative music in Saunders’ entire output. Soft tappings from the viola bring to mind the piano’s actions in Into the Blue, but they have precisely no effect here beyond colouration, causing the instrument to suddenly let rip an assertive soliloquy. Saunders rudely pulls the rug out by suddenly introducing all four radios at once, cutting off the viola – but these, too, are then abruptly silenced by the infinitesimal tinkling of the music box (playing a rendition of Der Kaiserwalzer by Johann Strauss II), ushering in a queasy epilogue of swishes and unstable pitches, punctuated by increasingly cutting accents. Molly’s Song 3 really is enormously bizarre, its collection of non-sequiturs making for a disconcerting and disorienting listen, abrupt gear changes by way of examining the various ‘shades’ hinted at in the title. Dichroic Seventeen is the only work on the disc to begin quietly. There’s something of a connection to Behind the Velvet Curtain, since the members of the ensemble (electric guitar, accordion, piano, 2 percussion, cello, 2 double basses) display a tendency to group around pitch centres which act as focal points for their actions. This is apparent early in the piece – in which a sequence of crescendos don’t so much attain a climax as attack ephemeral high points before moving on – and also in its final third, now coated in metallic percussion clatter. In between the piece passes through a bewildering episode of gestural suggestions, some of which become communally agreed upon and pursued, while others are instantly rejected (more echoes of Behind the Velvet Curtain). It’s interesting that such a structurally haphazard and unpredictable passage of music so clearly acts to energise and unify the ensemble. Saunders then introduces the soft looping crackle of a vinyl record (it recurs two more times), which acts to redirect everything into a quiet, lyrical episode that’s beautiful yet feels entirely detached from anything else, playing out in its own little bubble. 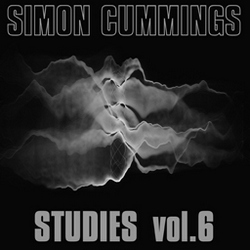 The performances on this disc are typically outstanding, highlighting various recurring ideas in Saunders’ earlier works, particularly the tension between lyricism and aggression (an ongoing feature of her music) and her use of mechanical devices introduced as inexplicable, ex machina ‘found objects’ that invariably create a discombobulating effect. 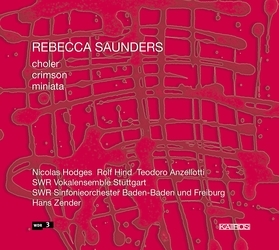 In 2008, Kairos released a second disc of Rebecca Saunders’ music, this time focusing on three works for or including the piano. choler (2004) for two pianos is arguably the most forbidding of the three. Saunders provides some background to the word ‘choler’ in her notes, and among its definitions is “anger, irascibility”, which immediately puts us back into familiar territory. She has certainly composed more hot-blooded music than that in choler, though perhaps nowhere has she turned the stop-start, halting manner of so many of her compositions into the kind of spasmodic vomiting heard here. Not surprisingly, it’s a tough piece to engage with, though its manner abruptly changes around the midpoint, introducing increasing quantities of soft, high chords (to call them lyrical would be to exaggerate) that, first, provide balance and as time goes on transform choler into a landscape of quietly fiery contemplation, not unlike the partially crusted surface of molten lava. There are eruptions, but it eventually settles into a split between the pianos, one high and forceful (mainly accented semitone clashes) and the other more sporadic in a lower register, which in turn calms into a quiet, homogeneous duet that’s a million miles from where we began. As in Alba, there are hints at the possibility of transcendence here but it’s far from being unequivocal; besides, from another perspective (with echoes of the way Messiaen used to discuss his piano music) i can’t help also hearing this material as a more simple musical depiction of the colour crimson, the definition of which Saunders has as “a rich deep red inclining to purple” – those last three words would make a good title for this final section of the piece. The third work on this disc is miniata for solo accordion, solo piano, orchestra and choir, completed in 2004. The use of voices is a relative rarity in Saunders’ music; until 2015, only three works had included them: albescere (2001), miniata and Soliloquy (2007), all of which use them as a small vocal group. More recently, she has composed a number of pieces for or with solo soprano: Skin (2016), Yes and O (both 2017). The Latin word ‘miniata’ refers to being “coloured with red lead, painted with vermilion or native cinnabar”, making this another of Saunders’ colour-inspired works. Despite the fact that the piece uses much larger forces than in most of her music, the way they’re used is familiar and tends to eschew large-scale tutti onslaughts in favour of the juxtaposition of discrete chamber or sectional formulations. Again, it’s a piece that comports itself as a diptych, with two distinct, contrasting halves. The first half is measured but muscular, seemingly engineered – or, at least, impelled – by the accordion and piano, periodically bringing about vertiginous swells connected by tender strands of sustained pitch. The swells are in some respects less violent due to the intricacies of their inner filigree yet the sense of volatility is magnified here, becoming a music that threatens – boasts even – that at any moment it could entirely overwhelm and subsume everything. Loud clattery ratchets act as a particularly tangible part of that threat, and the effect of the voices – used as a timbral resource rather than to articulate a text – lends a dramatic filmic sheen to the orchestra that’s spine-tingling and, at times, downright frightening. The repeated note idea employed by the piano in Behind the Velvet Curtain, Into the Blue and crimson returns here towards the end of the first half as an impetus for when the music starts to become subdued, causing everyone, especially the brass, to become riled up once again. The massive swells recurring throughout this first half have a clearly defined nature and palette, such that eventually there’s a sense of repetition, of going round in round in circles. It lasts 14 minutes but, structurally speaking, this material could theoretically keep going indefinitely. The latter half could hardly be more opposite: soft, vague material loosely tending around a central pitch (B♭). Considering how familiar this is in Saunders’ work, why does it sound so alien here? It may be the most truly other-worldly music Saunders’ has ever composed, and underpinning it all is an implied pressure, not so much a calm before a storm as a taut, barely-maintained equilibrium that could explode at any moment. While miniata avoids the stop-start approach used in much of her work, it uses instead the kind of elastic concertina structure employed in Alba, typified here by shifts in density and clarity. Considering this precarious musical fabric is struck by a number of heavy blows, it’s amazing that its integrity holds at all (as such. the cries of the choir seem almost to be the product of fear in the face of imminent catastrophe), but it does hold, passing beyond vagueness and potential hazard to a place of melody and ethereality. Once again, boundless ferocity finds its way above (or below) and beyond, possibly sublimated. Performed by the SWR Sinfonieorchester Baden-Baden und Freiburg with the SWR Vokalensemble Stuttgart, conducted by Hans Zender, and with Nicolas Hodges and Teodoro Anzellotti as soloists, it’s a magnificent performance of one of Saunders’ most extreme compositions. The piano works (Rolf Hind joining Hodges in choler) are recorded with a closeness that makes their poles of violence and calm so powerful as to feel, respectively, personal and intimate. The fact that i’ve explored Rebecca Saunders’ recorded output over four articles suggests that she’s well represented by recordings of her work. But almost half of her compositions haven’t yet been recorded, including such major works as chroma (in any of its to-date 20 iterations), insideout (admittedly, a difficult proposition being a 100-minute installation piece), murmurs, traces and the three concertos Still, Void and Alba. One hopes as her reputation continues to grow and consolidate that the recorded picture of Saunders’ output will become yet more complete.